Fennel And Persimon Filo Star Tart. Fancy making a Fennel And Persimon Filo Star Tart? Make this spectacular Persimon star tart for a vegetarian treat. 1 Remove and discard the leafy top from the Spanish persimon, then slice the fruit neatly. Cover and set aside. 2 Heat 2tbsp olive oil in a large frying pan and fry the onions until soft. Remove from the pan and cool. Add the remaining oil to the frying pan and gently fry the fennel until golden – about 6-7 minutes. Season with salt and pepper, then add 5tbsp water, the thyme, garlic and lemon zest. Cover with a lid and simmer for 8-10 minutes. Cool. 3 Preheat the oven to 220°C, fan oven 200°C, Gas mark 7. Grease a large baking sheet with melted butter. 4 Unroll the sheets of filo pastry. Brush each sheet of pastry lightly with butter, stacking them on top of each other on the baking sheet to form a large circle (you will need to put each sheet on top of the last at a different angle). 5 Spread the mustard evenly over the centre of the pastry (about 20cm across). Scatter the onions on top, then arrange the fennel and persimon slices on top, fanning them out into a star shape. Sprinkle with Parmesan shavings. Scrunch and fold the pastry around the edges of the tart. Bake for 20-25 minutes, then serve, garnished with thyme sprigs. Cook’s tip: Try crumbling some Blue Stilton or feta cheese onto the tart when it’s still warm – or add some slices of Cambozola or Italian Dolcelatte. 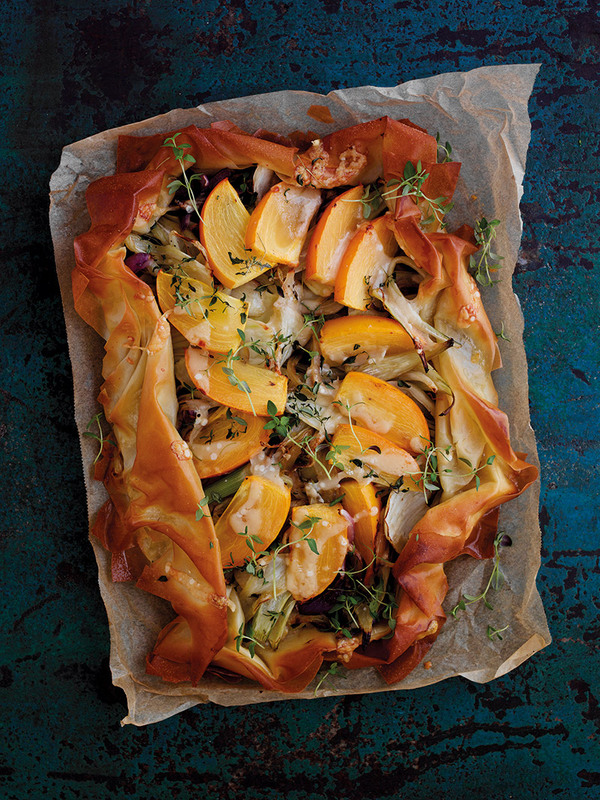 What do you think of this Fennel And Persimon Filo Star Tart recipe? King Prawn Curry With Spanish Persimon Kachumber. Persimon, Lime And Coconut Star Cake. Sizzled Chicken, Serrano and Persimon® Salad. Spanish Roast Cod with Chorizo and Persimon®. Persimon Superstar Salad: Bursting With Flavourful Foods. Joe Wadsack’s Pink Rock Collins..
"Natural Eating Guru Stacie Stewart Creates Natural Tonics With Caorunn Gin"
"Breville Moments Hot Drink Maker Review"